Clematis [Polish Spirit] in the West garden outside the Stone Gallery. Generally speaking most clematis are both easy to care for and their pruning requirements are modest and straightforward. 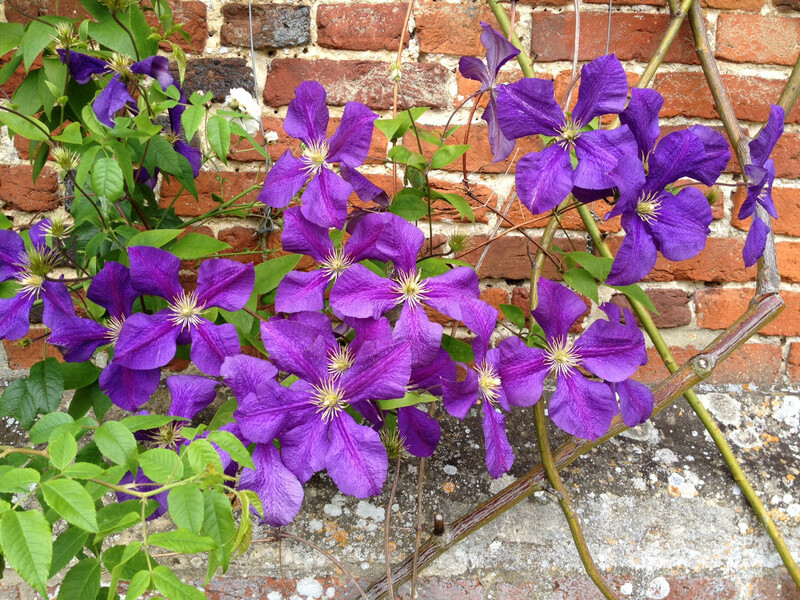 On the whole clematis are divided into three groups to make it easy to approach the pruning process. The objective here is to encourage strong healthy new growth and profuse flowering for the coming season while also controlling the shape and size of the plant within certain boundaries. As with all pruning, ensure you have a good pair of sharp secateurs to hand. Use of garden antibacterial spray is also advisable so as to avoid spreading disease between plants. These flower early in summer on old wood. Very little pruning is needed other than to remove dead and damaged stems after flowering. Train new stems to fill supports as needed. If the plant gets too large you can prune back to maintain the desired size. cirrhosa, C.armandii, C.alpina, C.macropetala. fall into this group. This group produce two flushes of flower – before early summer and again in late summer on new growth. Again all that is needed is the removal of dead and dying stems in late winter. Cut back to a strong pair of buds. Secure old and new growth with twine as required. C. ‘Nelly Moser’ and C. ‘Niobe’ are notable varieties in this group. These plants flower after early summer on this years growth and respond well to hard pruning. In late winter to early spring cut the top growth of these plants down to a healthy pair of buds above the base stems formed be the previous season. C. viticella, C.orientalis, C.texensis are examples of this group. Herbaceous clematis varieties, these can generally be cut to near ground level between autumn and early spring.